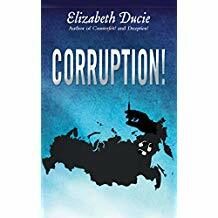 Having read the first two books in this series, Counterfeit, which I reviewed here, and Deception, which I reviewed here, I was delighted to receive an advanced copy of Corruption to review. Corruption is the third book in the Suzanne Jones series. The Prologue gets right to the heart of the issue that’s going to be dealt with in this story, and it’s a tough one. I then loved the opening to Part 1 all about the change in Francine Matheson’s life, and how that led onto becoming involved with the pharmaceutical industry in Russia. Life has similarly moved on for the Jones sisters. Suzanne has married a vet and has gone on an extended honeymoon in South America. Charlie is expecting a baby with her partner, Annie. However when Francine gets in touch with Charlie about her concerns Charlie is only too willing to come to her assistance. As help comes from an unexpected source friends and foes reappear in this well thought out plot that culminates in a thrilling climax. We also get to see more about Charlie’s background which was a bonus. I thoroughly enjoyed catching up with these characters again and I’m sure readers who like well-written crime novels filled with strong characters and interesting storylines would love this series. They could be read independently of one another, but why wouldn’t you start at the beginning?